Have loads to report as was in France for 10 days and ate like a queen (cake and everything else besides). We even made it to a two-star Michelin restaurant! Once I get some time and figure out how to upload photos from the new camera, I will report in full. Short report: Fab. Delicious. Verging on the orgasmically good. Have even more to report as then embarked on a complete health kick when I got home (minor slip-up there earlier on the chocolate front) so have lots of healthy recipes to post too. Regular visitors to the English Market in Cork may have noticed there is a new stall next to K. O’Connell’s fish stand. It’s called Fish To Go or possibly Fish2Go. Anyway, it sells prepared seafood like cooked prawns, fish patés, terrines and so on. I was feeling a bit lazy yesterday evening and felt like just getting lots of tasty bits and pieces for a salad ie no cooking required. I got crab claws cooked with chilli and garlic and fresh sardines done with lemon, mint and I think parsley. Both were just delicious and sang of summer to me. The sardines cost about €2.40 for four and 10 or 12 crab claws came in at a slightly eye-watering €7.50. Still, they were worth it considering all the effort I didn’t have to go to preparing them. My parents recently celebrated their 40th wedding anniversary. They’ve been on a celebratory holiday in New Zealand so to mark the anniversary, my brother and I sent them to The French Café in Auckland. It’s supposed to be New Zealand’s best restaurant. So that’s a recommendation. It’s probably slightly too far to go for dinner, though. It has rather stuck in my mind that one of the 10 points of the Happiness Manifesto on the BBC series Making Slough Happy was ‘Plant something and nurture it’. That’s not why I’ve been planting herbs and vegetables but had I thought about it, I would have imagined that growing food would have induced a deeply content and quiet sort of happiness. Far from it. I’m fecking ecstatic. Last night, I watered all my seed trays and seed beds and there wasn’t a hint of green to be seen. 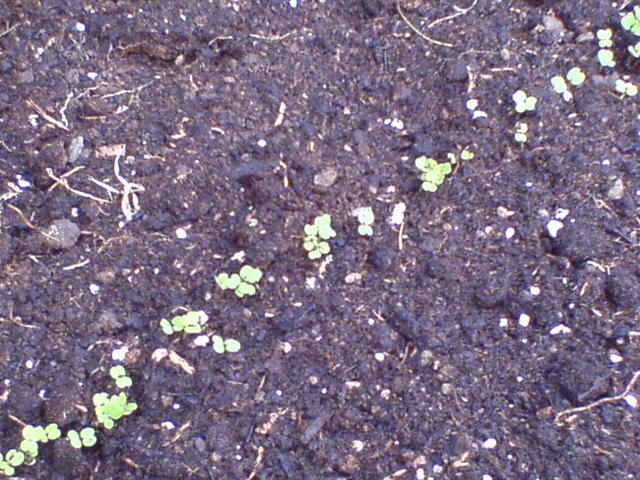 This morning, tiny seedlings have broken through in almost all of them. I am now a proud mama to infant thyme, marjoram, oregano, basil and rocket. No hint of life yet from any of the other seeds I planted but I live in hope. The extent to which I was overjoyed to see the little guys poking through really surprised me. I actually giggled out loud in the garden. The neighbours must think I’m mad. While engaged in a tour of Cork’s English Market as part of the food history course I’ve been doing, I fell into conversation with Damhnait, a classmate. She told me she’d had some success growing her own vegetables and promised to bring some seeds to the next class for me. Fair play to her, she did, and in doing so, rather challenged my all-mouth-and-no-trousers approach to growing my own food (which has so far resulted only in bounteous parsley and rosemary, despite paying them no attention whatsoever). Seeing as she had gone to the trouble of bringing me seeds, I was going to have to go to the trouble of planting them.